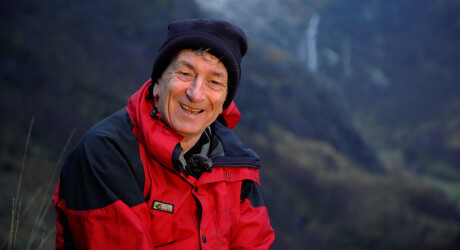 NOEL Williams, inspirational high school teacher, author of respected mountain guides, a founding member of the Lochaber Geopark, a retired member of Lochaber Mountain Rescue and accomplished hill runner, has won the prestigious Scottish Award for Excellence in Mountain Culture in 2019 – sponsored by Liberty British Aluminium. Nominated by the public and his peers as a mountain hero who celebrates achievement, accomplishment and the spirit of adventure, Noel Williams, from Torlundy, near Fort William, joins the Fort William Mountain Festival Hall of Fame as the 2019 recipient of The Scottish Award for Excellence in Mountain Culture in its 12th year. He joins previous esteemed winners that include Cameron McNeish, Dr Adam Watson, Jimmy Marshall, Myrtle Simpson and Ian Sykes (see all 11 former recipients below). The Scottish Award for Excellence in Mountain Culture will be presented to Noel Williams at a special ceremony on 23 February 2019 during the Fort William Mountain Festival 2019, which runs in and around Fort William and Lochaber, the ‘Outdoor Capital of the UK’, from 20 to 24 February 2019. The fifth Scottish Youth Ambassador for Mountain Culture will be announced shortly and will also receive their award on 23 February. Noel Williams has written and edited guidebooks that have inspired thousands of mountain walkers and climbers. His great knowledge of the mountains, shown in his books, guides and magazine articles, has been garnered through painstaking research and thousands of hours exploring the hills – From author of ‘Scrambles in Lochaber’ (1985) to editor of Highland Scrambles South (SMC 2017). His interest in geology has also reached print, including Ben Nevis and Glen Nevis – co-author (NCC 1989) and Exploring the Landscape of Ben Nevis & Glen Nevis (Nevis Partnership 2016). He’s also contributed photos to a number of different guides. He has also been a member of the Scottish Mountaineering Club (SMC) since 1982, where he took on roles of Vice President from 1997 to 1999 and president from 2014 to 2016. He was also the editor of the SMC Journal from 2008 to 2014. Noel taught for ten years at Lochaber High School where he was involved in running the school mountaineering club. Several of his pupils went on to become members of Lochaber Mountain Rescue Team. He later taught at Kinlochleven High School until his retirement in 2005. Although he claims to be not much of a runner, Noel Williams has completed 21 Ben Nevis Races, as well as Tranter’s Round and six marathons. He has also completed quite a few new routes on the sea cliffs of Skye. If you are keen to attend the Fort William Mountain Festival for a commissioned travel feature or adventure/activity feature, please contact Paddy Cuthbert to discuss a funded press trip to the ‘Outdoor Capital of the UK’. The Fort William Mountain Festival 2019 is presented in association with The Heritage Lottery Fund, Nevis Landscape Partnership, the ‘Outdoor Capital of the UK’, and the Highland Council and runs in and around Fort William in Lochaber, the ‘Outdoor Capital of the UK’, from Wednesday 20 to Sunday 24 February 2019. www.mountainfestival.co.uk. The festival attracts approaching 1,500 people over the five days and takes place each February in and around the town of Fort William. The Fort William Mountain Festival 2019 is sponsored by Rare Breed Production, Ellis Brigham, Gael Force (previously Corpach Boat Builders), Strathmore Hotels, Abacus Mountain Guides, Liberty, Nevis Range, the John Muir Trust, Thistle Access Ltd, the Outdoor Capital of the UK, Print Smith and Lamont Design. This prestigious annual award recognises and celebrates the achievements and accomplishments of one inspiring individual and their outstanding contributions to Scotland’s mountains, encompassing sport, theatre, art, photography, film and literature. The award was set up in 2008 by the Highland Mountain Culture Association Ltd, organisers of the Fort William Mountain Festival. The 2019 award is sponsored by Liberty British Aluminium. The Youth Award is sponsored jointly by Gael Force Group and the Nevis Landscape Partnership / Heritage Lottery Fund. Festival organisers – The Highland Mountain Culture Association Limited - is a not-for-profit organisation, whose aim is to promote the understanding and appreciation of the world’s mountain places and people, by creating opportunities for people of all ages to share their mountain experiences, ideas and visions. To showcase these ideals, it stages annually a programme of events within the Lochaber area, called The Fort William Mountain Festival. The ‘Outdoor Capital of the UK’ is Lochaber Chamber of Commerce’s tourism brand, promoting adventure for all! The Chamber publicises, sponsors and promotes Fort William and Lochaber as the best place in the UK for everyone to experience the outdoors; with a view to developing local jobs and wealth and encouraging sustainable economic growth. The ‘Outdoor Capital of the UK’ is Lochaber Chamber of Commerce’s tourism brand, promoting adventure for all! The Chamber publicises, sponsors and promotes Fort William and Lochaber as the best place in the UK for everyone to experience the outdoors; with a view to developing local jobs and wealth and encouraging sustainable economic growth. This is done through a range of collaborative marketing initiatives and activities. The organisation currently has a wide range of member businesses ranging from accommodation, food and drink and activity providers to non-tourism focused businesses who support the aims of the Lochaber Chamber of Commerce and acknowledge that tourism is crucial to the local economy. Many of these businesses are SMEs and by pulling resources and working as a team the Lochaber Chamber of Commerce achieves the positive results that individually the members couldn’t otherwise reach. The Chamber also produces the ‘Outdoor Capital of the UK’ website, the go-to site for local events, outdoor activities and visitor accommodation in the area. www.outdoorcapital.co.uk / www.lochaberchamber.co.uk. MEDIA RELEASE issued by Littlehouse Media. You too can share your stories (aka press or media releases), on this site. Email here for more information. Check out too twitter.com/allOutdoorsPR and twitter.com/allFestivalsPR.